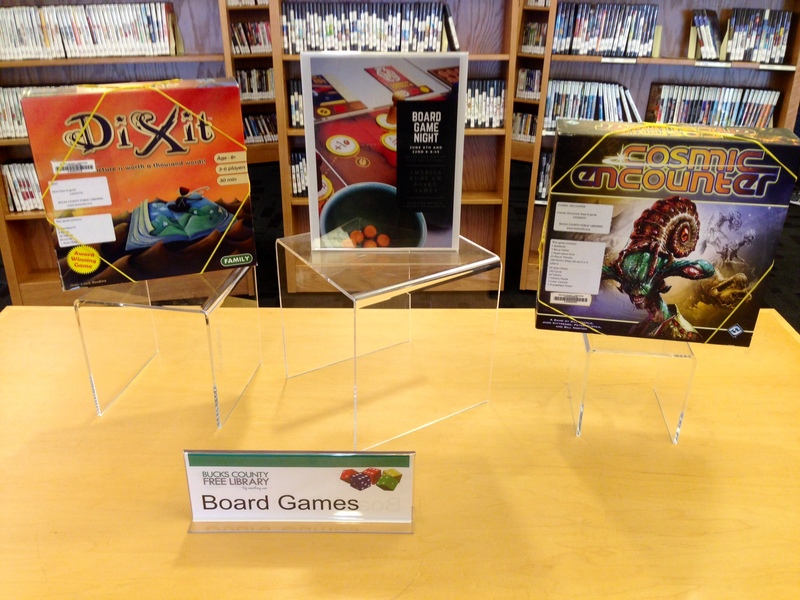 We are six months into circulating board games at the Bucks County Library System. Let’s see what has changed from last time! Escape: The Curse of the Temple (16): This one is still the reigning champion and going strong. Everyone loves Escape and it is barely in the library. Ticket to Ride (6 holds on it currently): I don’t often check how many holds the games have but when I do, Ticket to Ride is always at the top of the list. Everyone wants it. 7 Wonders (15): 7 Wonders had a strong presence last time I checked and is still only slightly behind the front runner, Escape. The big difference is that 7 Wonders is often picked up for gaming nights. It is a constant contender at the library “Board Game for Grownups” gaming night. Pandemic (11): Poor Pandemic had zero circulations last time I checked and now it is up to 11! It just took some time to get acclimated, I suppose. I’m pretty sure it will keep on climbing higher as well. I still can’t account for the slow start but it is nice to see it back in the swing of things. Carcassonne (12): Oh Carcassonne…we still love you, you old-timer. This venerable sir/madam gets it’s most use during board game events and has been picked up off of the display and played on the floor a few times. 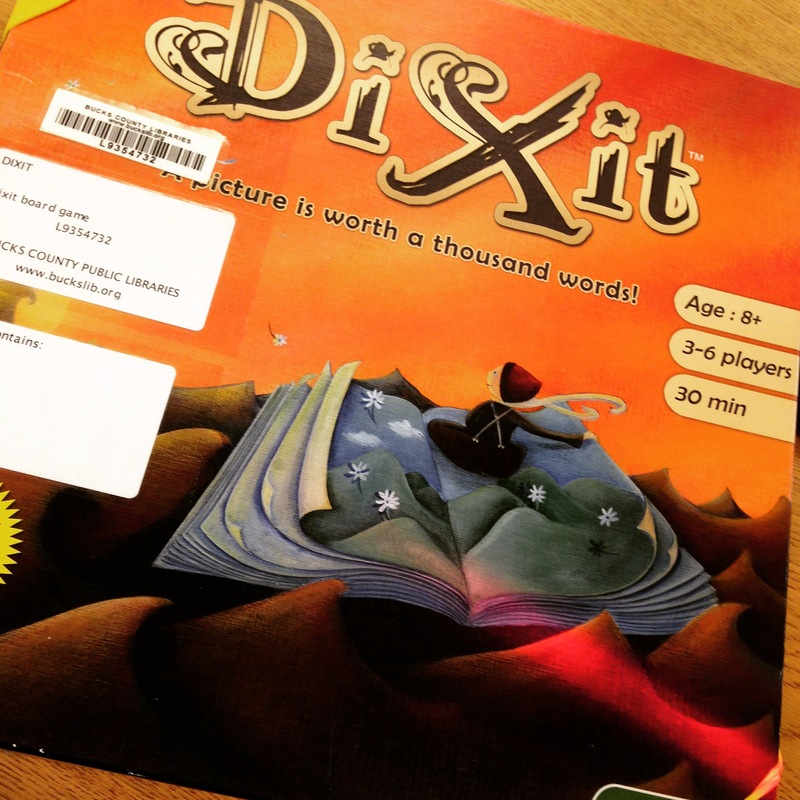 Dixit is very popular but all those labels can really gunk up a smaller box-top. Be careful about labeling the boxes. With smaller games, the inventory list, the bar-code, and whatever crap your library likes to adhere to your media will obscure the box-top. And that box-top helps sell the game to people. Keep the display close to the desk and up-sell all the time. When an opening presents itself to promote the collection, I do so. If people are interested, I treat it like a reference interview and find the perfect game for them (this is hard when most everything is checked out but that is a good problem). Take time to play and teach games from the circulation desk. Small games like Hanabi or Love Letter are perfect for a quick teach at the table. The take-away I hope to achieve is that the library has something new and interesting to offer. Couple your display with signage for your board game events. You mentioned that the Games are Bagged, what type of bags are you using? We have since ceased using bags for the collection. They didn’t provide the same visibility the actual game boxes provided — I mean, the boxes are usually colorful and attractive. So we did use the large zippered canvas bags provided by our Friends group. We also used clear bags with the hanger tops. Both can be found on Demco. Right now, we use four-corner rubber bands to keep the box tops secured.